Back home after the war, Bob and an old Chicago buddy set out for California in 1946. He earned his degree in psychology from UC Berkeley. "Uncertain in my direction in life, “I had various jobs—I was a sheet metal worker, and I worked in a cannery in Berkeley. I even worked as an insurance adjuster. I went from one thing to another, trying to decide what I wanted to do.” Finally he went to school at UC Berkeley and got a degree in social work. “I worked at Langley-Porter Psychiatric Hospital in San Francisco. At the time they were still performing lobotomies and doing electric-shock therapy. Then I got my masters and went to New York City and worked as a social worker at a mental hospital, where they discovered the drugs that could be used in place of the old therapies. So I saw both ends of the spectrum.” After that, Bob went to work for the Veteran’s Administration, and for the next seven years he worked with VA patients and lived in Greenwich Village—a vibrant, fascinating scene in the 1950s, the years of the Beat Generation. After that, Bob made his way back to the San Francisco Bay Area, where he has settled at last. Bob worked for some years as the Activities Director at International House. He also continued to do social work at San Francisco’s Fort Miley VA Hospital, working with veterans suffering with PTSD. Bob’s engaging way of telling his many stories is clearly part of the reason Mary has so enjoyed getting to know him over the past three years or so. Mary works out of her home, and even though she is very busy, that can be isolating. Volunteering for Ashby Village and other organizations is a perfect antidote. “I welcome the social contacts I get from that,” she says. “Before I got so busy with other things, I used to manage the Ashby Village Facebook page—I was on the communications team.” Before becoming a member, Bob, too, had been a volunteer at Ashby Village. When he still had a car, he visited people and also volunteered in the office, and helping with computer issues. But then he had to stop driving, and he needed services himself. After that first meeting, Mary began to help Bob with a variety of things, especially grocery shopping. Mary and Bob worked together to help Bob organize his needs so that he made less frequent demands on friends and Ashby Village volunteers. Bob laughs. “Oh, yes, that’s right! I’d keep thinking of one thing and then another, and finally she had to set a limit.” Mary laughs, "Volunteers do have to learn how to set limits!" Mary’s character combines warm-heartedness with a firm hand when it comes to dealing with somebody like Bob. And her own adventurous side—as evidenced by her love of dragon boat racing—gives her something in common with the adventurous side of Bob. “Dragon boat racing is one my biggest things right now!” says Mary. “I had joined the YMCA to work out and get in shape, but I found that paddling offered a social outlet on top of a physical workout.” She explains that a dragon boat is typically about 40 feet long, propelled by a team of 20 paddlers and a steersperson. Dragon boat racing began in ancient China and is an enduring tradition in that country. In the Bay Area, there are over 2,000 participants racing locally and internationally. In fact, DragonMax, a Berkeley dragon boat club, has partnered with Ashby Village for the past two years in a fun, no-holds-barred Volunteer Play-It-Forward event. Of course Mary has hosted it on behalf of DragonMax. The club is part of the Berkeley Racing Canoe Center (BRCC), a non-profit organization. “I’m currently on the Board of Directors as the Outreach Director,” says Mary. “We have a team that competes locally and around the United States. We also do a lot of community outreach.” She continues, “I’ve also gone with a different, pickup team to race in the Philippines, Puerto Rico, and Hong Kong, which has really been fun! I love the social aspect of dragon boating, and I get great exercise at the same time.” Obviously, she’s hooked! Bob himself is no stranger to the YMCA. At his present residence in San Pablo’s Brookdale Senior Living facility, he can be seen zipping around with his walker at top speed in the hallways and community social areas, chatting with other residents and visiting the garden outdoors. When asked how he keeps so active, Bob says, “I go into downtown Berkeley two or three times a week, so I can work out at the YMCA. I mostly work on the machines—you know, rowing and stationary bike.” It should be added that to get there, he uses his walker to get to the bus, which takes him to BART, and then walks to the Y. And home again, of course, the same way. This particular afternoon we sit in Betty’s sunny Berkeley living room looking out at a panoramic view of San Francisco Bay and sipping ginger tea. Everywhere the walls are hung with paintings and drawings acquired over many years, and all around the room are shelves lined with a lifetime’s collection of books. Betty herself is a writer and editor. With her husband (author and educator Ted Roszak), she co-edited Masculine/Feminine, Readings in Sexual Mythology and the Liberation of Women. But she is also a poet. She recently published a poetry collection, For Want of the Golden City, which includes translations of poems by Pablo Neruda. Keeping company with the books in Betty's home are her clusters of cylinders, large and small, set on end, their curved surfaces alive with myriad patterns in colors ranging from earthy tones to vibrant hues. Gradually, you notice they’re tucked in everywhere—tall ones grouped in corners, smaller ones set on shelves or tables. Betty creates these unique Tubes, as she calls them, by using a combination of acrylic paint and collage. The Tubes display remarkable detail when viewed up close. The ultra-heavy cardboard tubes themselves come from carpet companies. “I believe in recycling,” says Betty, with her characteristic twinkling smile. Creating art through recycling isn’t the only progressive idea Betty has put into action. Betty explains that she and her husband, prominent Berkeley academic, thinker, and author Ted Roszak, were involved in Ashby Village right from the beginning. “We were in discussions with the founders,” she recalls. “We had learned about the original organization in Boston, and we thought—what a great idea. 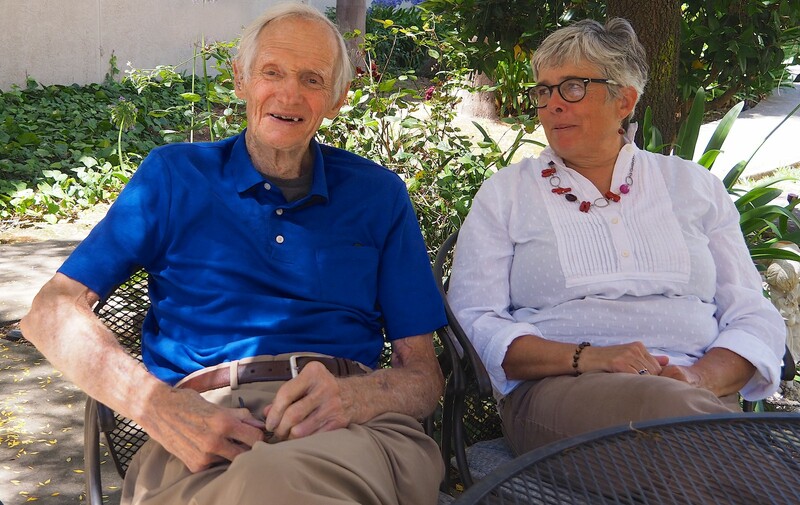 We found out that people were starting an organization here, and we got involved, went to meetings, and so forth.” She and Ted became a vital part of catapulting Ashby Village from a small neighborhood organization to one that included all of Berkeley and many surrounding communities. Sure enough, about a year ago Betty found that she needed help with transportation to doctors’ appointments and other places, as well as for grocery shopping. Which leads to the story of how Betty and Valerie met. Five years ago, Valerie—then a recent volunteer at Ashby Village—responded to Betty’s request for a driver to take her grocery shopping. Now they have a regular weekly “date” to shop at Trader Joe’s, which has offered them a chance over the years to come to know each other and enjoy their differences and similarities.hem a chance over the years to come to know each other and enjoy their differences and similarities. One of their favorite ways to spend time together is simply doing routine errands. On these jaunts, they enjoy just being together and chatting. 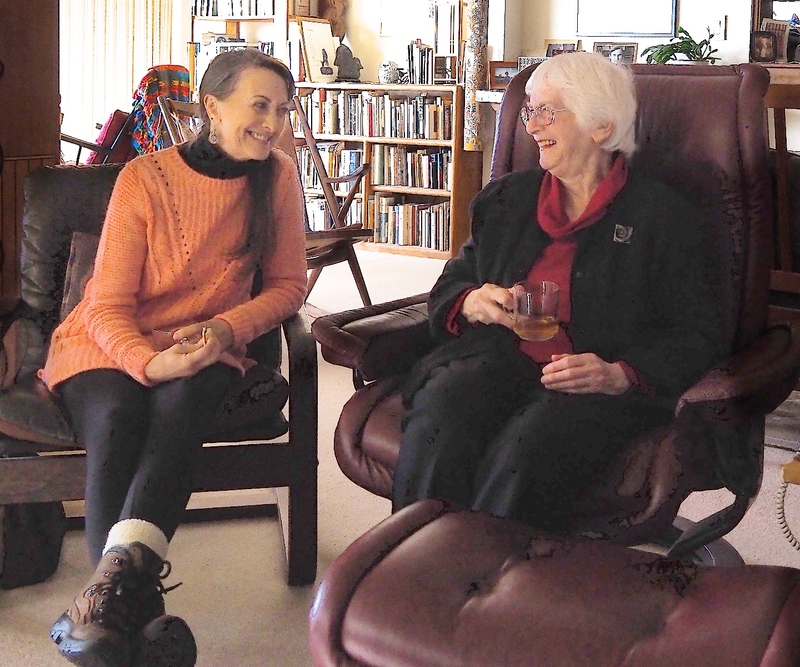 “We just seem to get along even though in many ways we’re very different,” says Betty. “We talk about a lot of things—current events, politics, everything.” “And our families—we talk about our families,” smiles Valerie. As we end our talk and prepare to say goodbye, Valerie suddenly realizes it’s Friday. “Hey, you know what, Betty?” she says happily, “Tomorrow is shopping day!” . But then, at the age of 61, Kris was diagnosed with breast cancer. “It was totally a life-changing event for me. All of a sudden I realized, maybe I don’t have that much time, and maybe I don’t want to be doing this forever.” She went through treatment, recovered, and groomed a successor. At 64, she retired, with no intentions but to take it easy, enjoy life, and travel. Six months later, Kris had cleaned out all her drawers and was totally bored. Her oncologist, Lisa Bailey, M.D., suggested she come volunteer in the Carol Ann Read Breast Health Center, which Bailey had created, to help other women who were going through what Owens had been through. “I got really involved with that,” Kris says. “It made me feel good to help someone, and my only regret was that I didn’t have someone like me to help when I got cancer.” Kris volunteered there for two days a week, for three years. Just as she was casting about for something else to do, Owens was invited to an Ashby Village neighborhood chat at the Emeryville Watergate, near where she lives. She immediately signed up to volunteer. She did that “ferociously,” as she puts it, five days a week. 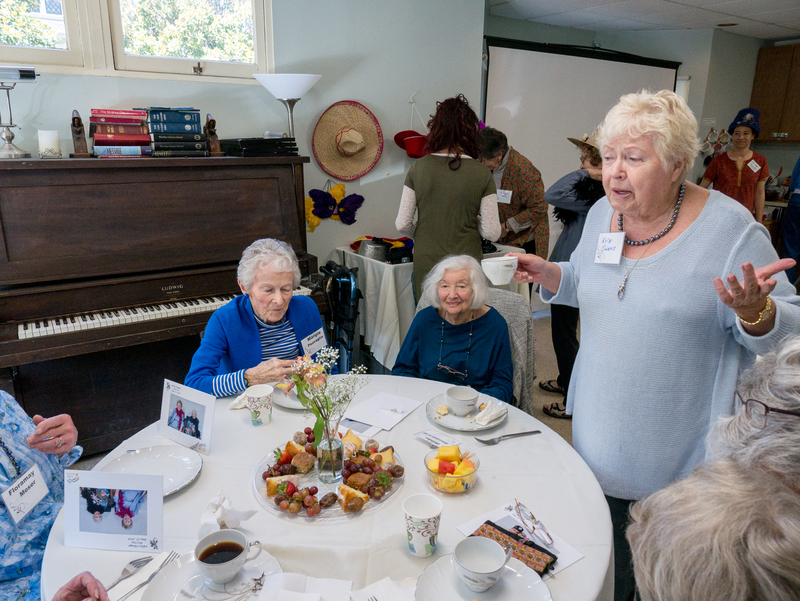 She took members grocery shopping and to hair appointments, and she went to as many Village events, as she could—from yoga classes to luncheons. She loved everyone she met. After a year she became a member, as well as a volunteer, and began an even deeper involvement in the life of Ashby Village. After meeting one amazing 90-year-old after another, she realized how valuable the help of a MedPal could be. So she decided to take Marion Anderson’s MedPal course. “Then Marion asked me to join in her classes, and I would play the patient and she would play the doctor, and we would do some skits about what to do and not do,” says Kris. The experience has turned out better than she could have imagined. “It’s surprising because my whole career was in a very contentious industry, working in a competitive, nasty business,” she says. “To survive that you have to be really aggressive and assertive. Compassion wasn’t even in my dictionary! “So this is a new part of my life,” says Kris. “Now I am totally, completely involved in Ashby Village and I think the concept is the greatest thing anyone has ever done for seniors. I love the idea. In the past I have given money only to women’s causes, such as breast cancer organizations and Friends of Faith Fancher. Now Ashby Village will get all of my donations because they are local and the money stays here and it goes to the members and the staff and to the members who can’t afford the fee.